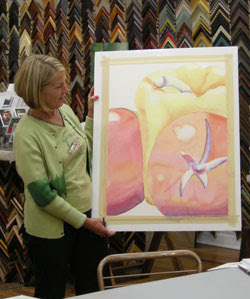 I teach a Drop-In Watercolor Class on Friday mornings at Margot's Gallery and Frame in downtown Oxford, Michigan. Last Friday we worked on a large still life with vegetables. I set up some tomatoes and a yellow pepper and we worked on a full sheet of watercolor paper. This is SueAnn with her painting which is not yet complete, but shows the beginning washes. We worked with saving whites with water, painting soft and crisp edges and we worked especially with large wet washes. We hope to complete the paintings this next Friday. There will be a few students who will begin another project, which I will bring in, but the rest will continue to work on the vegetables. The still life was set up in the center so we all worked from different perspectives. Everyone had a different view and each added their own personality and skills to the piece. I really enjoy seeing how different all of the pieces turn out, even though we are working step-by-step together. I usually demonstrate a technique and then the students work with that technique to develop a stage of their painting. We have such a great group on Friday mornings! If you would like to know more about my classes just visit my web page: http://watercolorworksart.com/Classes.htm. I will also be speaking and doing a small demonstration on Monday night at the Washington Art Guild near Romeo. Maybe I will see you there!